The popular pain reliever Tylenol is found in more than 600 prescription and over-the-counter medications. While Tylenol is relatively safe when taken at the correct dosage, ingesting too much of the drug can lead to serious complications, including liver failure. Tylenol (acetaminophen) is the most popular over-the-counter (OTC) pain relief medication used in the U.S. and around the world. The drug was first sold in 1955 as Tylenol Elixer for Children, and today millions of American adults and children use the drug every week for common ailments such as head and body aches, colds and fevers. In fact, according to the Consumer Healthcare Products Association, about 52 million consumers in the U.S. use products containing Tylenol each week. Manufactured by Johnson & Johnson subsidiary McNeil Laboratories, the drug is also available in generic. It is marketed as an effective painkiller that is safer than non-steroidal anti-inflammatory drugs (NSAIDs) such as aspirin or ibuprofen, which are associated with stomach discomfort or bleeding. Acetaminophen is the active ingredient in Tylenol and generic name of the drug, commonly found in other medications as well. Pharmacies compound Tylenol into more than 600 prescription and OTC medicines, and the drug generates more than $1 billion a year for McNeil. Tylenol belongs to a class of drugs called centrally acting analgesics and antipyretic agents. An analgesic relieves pain. An antipyretic reduces fevers. For more than 50 years, doctors prescribed Tylenol for both uses. Unlike other analgesics like aspirin (Bayer) and ibuprofen (Advil, Motrin), Tylenol does not treat inflammation. It is most effective for minor aches and pains but can be used safely for long-term chronic pain such as arthritis. In fact, the American College of Rheumatology recommends Tylenol to treat arthritis, and it is especially useful in types of arthritis that are not accompanied by inflammation, like osteoarthritis. Researchers don’t fully understand how Tylenol works. Although there are several theories, none seems to satisfy everyone. One theory is that Tylenol controls fever and pain by blocking an enzyme called cyclooxygenase (COX-1). COX sends out chemicals known as prostaglandins that make the body feel pain and induce fever in response to an injury or illness. If this theory is correct, then Tylenol works very similarly to aspirin, ibuprofen and other nonsteroidal anti-inflammatory drugs (NSAIDs). Some researchers believe Tylenol works on the endocannabinoid system, which plays a part in the sensation of pain in the body. The main ingredient in marijuana, THC, also works through this system, which explains why some people look to marijuana for a form of pain relief. A third theory is that Tylenol may also alter signaling from the neurotransmitter serotonin. Other researchers believe the drug’s effectiveness stems from the fact it inhibits neurotransmitter receptors in the brain that register pain, such as N-methyl-D-aspartate and substance P.
Tylenol on its own is a non-prescription (over-the-counter) medication. While prescription medications are required to include certain prescribing information, such as common side effects, non-prescription medications like Tylenol do not typically contain the same information. Therefore, much of the information regarding side effects provided for over-the-counter Tylenol medications refers to serious side effects of the drug, usually due to overdose. Tylenol is associated with serious complications, including liver damage and rare but dangerous skin reactions. It is the leading cause of acute liver failure in the U.S., and the drug in some cases led to fatalities. The active ingredient in Tylenol, acetaminophen, accounts for more than 100,000 calls to poison centers, roughly 60,000 emergency-room visits and hundreds of deaths each year in the U.S. In England, it is the leading cause of liver failure requiring transplants. FDA issued guidelines for adding overdose information to packages. The agency confirmed the link between Tylenol and liver damage and added a black box warning, the agency’s strongest warning, to the drug’s label. FDA asked drug manufacturers to limit the strength of acetaminophen in prescription drug products to 325 mg. The agency added a warning highlighting the potential for allergic reactions (e.g., swelling of the face, mouth, and throat, difficulty breathing, itching, or rash) to the label of all prescription drug products that contain acetaminophen. FDA released a safety warning about Tylenol and skin reactions. The agency announced its intent to take steps to withdraw approval of prescription combination drug products containing more than 325 mg of acetaminophen. FDA announces findings from review of acetaminophen use during pregnancy. The FDA reviewed possible risks of acetaminophen use during pregnancy and released its findings in a January 2015 Drug Safety Communication. 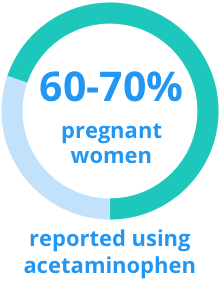 According to the safety communication, two U.S. studies indicate that 60 to 70 percent of pregnant women in the U.S. reported using acetaminophen anytime during pregnancy. One study reported an increased association between acetaminophen use in pregnancy and attention deficit hyperactivity disorder (ADHD) in children. Women reporting any acetaminophen use in pregnancy were also significantly more likely to have a child with a hyperkinetic disorder (HKD) diagnosis or a child who used ADHD medications, compared to unexposed women, according to the FDA. “Associations for all outcomes were strongest for acetaminophen use in multiple trimesters and for more than 20 weeks during pregnancy,” the FDA noted. 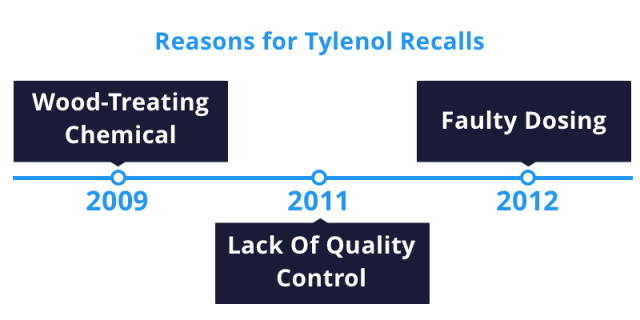 Tylenol faced a string of recalls from 2009 to 2012. Some Tylenol products didn’t return to store shelves until 2013. In 2009, McNeil recalled many Tylenol brands because a chemical for treating wood made it into the medicine, causing nausea, vomiting and diarrhea. In 2011, it expanded the recall to include several more lots of the medication. The recall involved tens of thousands of Tylenol products and prompted Johnson & Johnson to close a manufacturing plant. Furthermore, the FDA stepped in to supervise quality control measures at three plants. Then in 2012, McNeil recalled nearly 600,000 bottles of infant Tylenol for faulty dosing systems that could result in babies receiving too little or too much medicine. The drug was also linked to several murders in 1982 called the Chicago Tylenol Murders. Several people in Chicago died after taking Extra-Strength Tylenol caplets that were laced with cyanide. McNeil was not implicated in the murders because the bottles came from different factories, and all seven deaths took place in the Chicago area, ruling out the possibility of tampering during production. After the murders, Johnson & Johnson sent warnings to hospitals and distributors, stopped all advertising and producing Tylenol and recalled approximately 31 million bottles. The murders remain unsolved. Tylenol is available in tablet, chewable tablet, capsule, suspension or solution (liquid), extended-release (long-acting) tablet and orally disintegrating tablet forms. It is also available in several dose amounts, usually from 300mg to 1000mg. People can obtain it in prescription and non-prescription strengths. The maximum indicated dose in a 24-hour period should not exceed 4,000 mg. Taking more than 4,000 mg of Tylenol a day puts users at risk for liver failure. Experts say anyone taking Tylenol long-term for chronic pain should consider having liver function tests done once or twice a year. Users do not need to take Tylenol with food or on a full stomach. Don’t take acetaminophen if you drink three or more alcoholic drinks a day, and don’t take more than one product that contains acetaminophen at a time. To administer the medicine to children, use the child-specific product with a dosing cup or dropper that comes with it. Teaspoons found in the home vary in size and their use to administer Tylenol could overdose or underdose a child. You may need to shake the liquid before each use. The Tylenol Meltaways chewable tablet softens in the mouth to make it easier to chew. Chew the tablet thoroughly before swallowing it. Meltaways are orally disintegrating tablets. Place the tablet in your mouth and either wait for it to dissolve or chew it before swallowing. Extended-release tablets are meant to be swallowed whole. Do not split, chew, crush or dissolve these tablets before swallowing. Because acetaminophen is present in hundreds of medications, it’s important to read the labels of all prescription and OTC drugs to see if they contain it. The FDA, National Council for Prescription Drug Programs (NCPDP) and pharmacies across the nation are working to ensure “acetaminophen” is fully spelled out on prescription labels. NCPDP estimates that more than 75 percent of pharmacies in the U.S. are part of this effort. Tylenol is used in combination with other active ingredients in a number of prescription and OTC medications.